Roman Chamomile Essential Oil (Chamaemelum nobile) is also commonly known as English Chamomile and Whig Plant. The oil has a warm, sweet, herbaceous, and fruity fragrance, presenting middle-top notes. Roman Chamomile Essential Oil is part of the Rocky Mountain Oils Relief, Skin Care, and Sleep collections. A peaceful, soothing essential oil, Roman Chamomile Essential Oil is wonderful to diffuse at bedtime. The gentle oil also may be used topically in skin care routines, including for sensitive skin and for children. It is often used in skin care products, shampoos, and soaps. Mix ingredients together and store in a dark-colored glass bottle. Keep bottle tightly closed when not in use. Diffuse as needed. Add 1/2 teaspoon of FCO or other carrier oil and massage into the neck and shoulders. Mix ingredients together and store in a dark-colored glass container. Massage into the affected area when necessary. Put the sugar in a small mixing bowl. Add carrier oil and stir thoroughly with a spoon. Add essential oils and stir. Spoon into a glass container with a tight-fitting lid. Softly scrub legs with mixture for about 5 minutes. Rinse and enjoy your silky smooth legs. Both Chamomile oils are very safe and can be used with young children. They are different in the chemical makeup, smell, color, and viscosity. Most people choose between the oils by the scent they prefer. Roman Chamomile is a light yellow to clear color oil with low viscosity. Its aroma is fresh, sweet, fruity, herbaceous, and slightly milky. German Chamomile is a dark blue color with high viscosity. Warm the bottle in your hand before using to decrease the viscosity. Its aroma is warm, sweet, herbaceous and slightly woody. I added a few drops to my usual nighttime blend and noticed that we slept better than before. 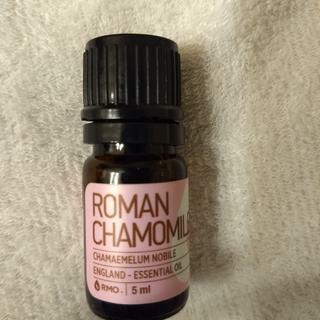 If you’re torn between a Roman chamomile and German chamomile and are wanting the one that is reminiscent of chamomile tea...Roman is the one for you! The smell is absolutely wonderful. I put this Essential Oil in my diffuser at night. I like the smell and it helps my husband and I sleep restfully. I had previously purchased Roman chamomile from another brand and it smelled rancid. This oil smells like it should. I love RMO! Another of my favorites! Very calming. Helps my headaches sometimes when lavender doesn’t. This oil is very powerful! A little goes a long way. It's a very strong chamomile scent. The Roman is much more pleasing than the German in my opinion. I love the fragrance and in the diffuser it works like a charm. It does make me a bit groggy in the morning. I'm still experimenting. Maybe just 1 drop all night. Since I cannot get this thru YL currently OOS, I get it from RMO. Y'all it smells so wonderful! I've purchased 3 bottles in the last year. I love it! This is the first time I 've ever bought Roman chamomile. I love it it helps me sleep. Lovely scent and appears to be high quality EO at a reasonable price. Shipped quickly and I am very pleased with my purchase. I have loved Roman Chamomile for years, but it has become increasingly harder to find and more expensive. I finally tried this one and am very pleased and impressed! It is so soothing and wonderful! I love the smell! This is a really special essential oil. If you haven't tried it, it is definitely worth it! I love this stuff. This is my second bottle. It has a very nice aroma. I use it in mys sleep mixture. This oil is expensive, but worth it. Helps with sleep and many other uses! It smells great and is very relaxing when diffused. I fall asleep and stay asleep when diffusing at bedtime. Loving the smell and it seems to relax me. Did not disappoint. Have used it in my diffuser and for my rollers. Very nice smell, I am very happy with the quality of RMO oils. I love all your essential oils. Love this oil. Great for my skin and helps our whole house sleep peacefully! I love Roman Chamomile. It has a soothing sweet smelling and it's great for children. I use it for ear aches, help with fever reducing baths and just calming. I use Chamomile Roman, At Peace and Lavender every night in my diffuser. I love the scent and it helps me fall to sleep. The Chamomile alone has a great scent. I will be purchasing it again. I use Roman Chamomile when I want to step up from my normal lavender use. Good stuff. I love it. I add a drop to my CPAP adapter and fall right to sleep. I sleep sound and hardly move, according to my Fitbit. When I wake up, Im more alert and cheerful. I highly recommend this product and will buy more again. This is a calming effective oil! I purchased the Roman Chamomile (10 drops) along with Bergamot (10 drops) and Vetiver (5 drops) to help me through the grieving process. I combined all three along with Ylang Ylang (10 drops) and Lavender (10 drops) with two cups of epsom salt and soaked for a couple hours. I know the number of drops I used was double the norm, but I really wanted a strong bath. I felt relief, soothed, calmed, and relaxed. I was very impressed at how relaxed I felt, which I attribute to the Roman Chamomile. Since then, I've used it with another wonderful combination of Roman Chamomile, Patchouli, Ylang Ylang, Orange, and a citrus blend in another epsom salt bath and it was woooonderful. Yes, Roman Chamomile is more expensive than a lot of essential oils, but it doesn't take much and it is very effective. I love the Roman Chamomile! A little goes a long way. I really like RM oils. They smell great! I am impressed with all the oils I've ordered so far. I would recommend RMO to anyone. The scent and quality are great! I definitely recommend it to others. I have been using it for a Face care blend, Bug away blend, and Aches and pain blend. I really like my Roman Chamomile essential oil. I use it at night to help me relax and go to sleep. I mix 2 drops with 1 or 2 drops of Lavender essential oil in a little olive oil and apply it to the soles of my feet and behind my neck for a restful night's sleep. I love my Rocky Mountain oils, they are as good as anybody else's and sometimes a better value! I can be a consumer and don't have to pay extra to be a member. This is one of my favorite oils. I use it along with lavender before bed and it definitely helps me sleep better. I love the smell! Wonderful aroma. One of the best chamomiles I've come across. ?? It! Expensive for my budget but I plan to use it sparingly. I like how it smells and I added a few drops to my facial lotion. Also added a few drops to an herbal pillow. First time getting this oil - WOnDERFUL. It blends with so well with several of my other oils. Does it help with restless legs? BEST ANSWER: Great questions! We are committed to providing quality products and exceptional service. To best guide our customers, we categorize our various singles and blends into seven collections on our website. Each collection can help with a variety of needs. We wish we could help provide the advice that you are needing. Unfortunately, we cannot diagnose health conditions or make any treatment recommendations.